A lot of my recent posts have featured snowy landscapes or advice for winter adventures. Well…because…it’s winter, and winter is my favorite time of the year. But I suppose if you wanted to, you could extend your snowy adventures into the late spring or summer here in the Northern Hemisphere, or you could adopt a “never summer” mentality and go to the Southern Hemisphere each year in June for a second summer. Not bad ideas…but if you’re going to become a snow chaser, you should check out Mike Zawaski’s new book Snow Travel: Skills for Climbing, Hiking, and Crossing Over Snow. 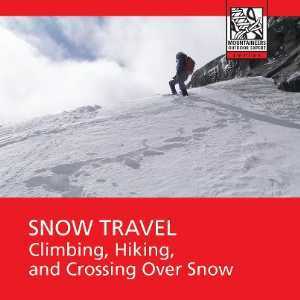 This new book in the Mountaineers Outdoor Experts Series will tell you all you need to know about how to travel effectively on snowy terrain, including how to choose and use essential gear such as an ice axe and crampons, how to self-arrest when you’re falling down a slippery slope, and how to safely descend snowy terrain. So…if you’re a fellow lover of winter, and you seek out opportunities to adventure outdoors in snowy conditions, this book is one you’ll want to add to your shelf whether you’re likely to encounter a snow-covered slope while summer hiking in the Sierra Nevada or whether you’re out there getting after your winter play, as usual. Want to know more about Zawaski’s new book? Photo © The Mountaineers Books & Braided River. 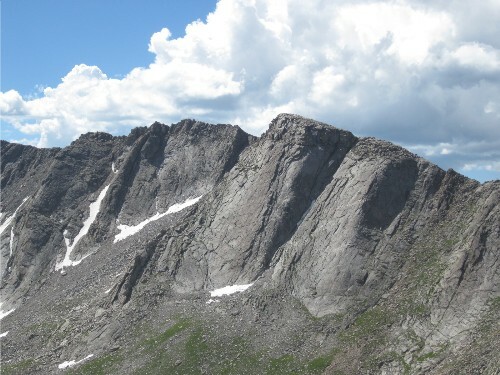 If you’re planning on hiking any of Colorado’s Fourteeners–peaks above 14,000 feet–this winter or this summer, get in shape first to avoid altitude illnesses including acute mountain sickness (AMS) or the life-threatening conditions of high altitude pulmonary edema (HAPE) and high altitude cerebral edema (HACE). 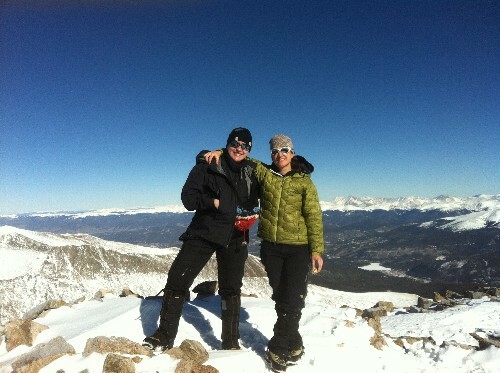 Physical conditioning and gradual acclimatization can help prevent altitude illnesses at moderate altitudes (8,000 to 14,000) feet, but knowing the symptoms of altitude illnesses is important, too. 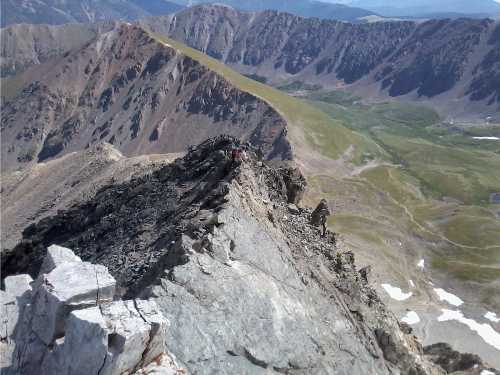 Besides having the proper skill, physical conditioning, and gear with you to hike your next Fourteener, I hope these photos of a few Colorado Fourteeners will also help get you inspired. 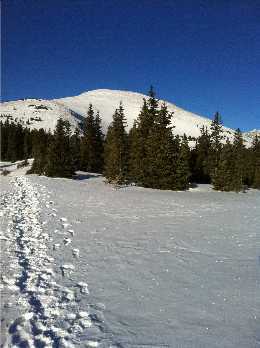 Get going…get outside…and enjoy your next Fourteener hike, ski, or climb! 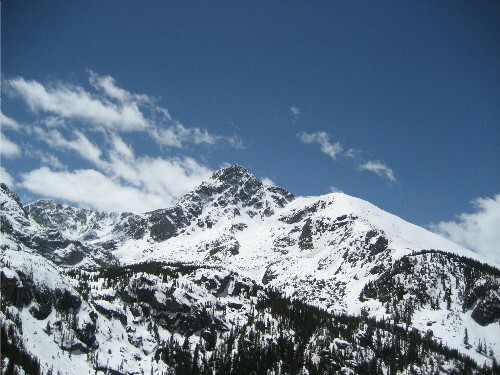 Want to know more about altitude illnesses, symptoms, and prevention? Some of my most memorable hiking, climbing, and skiing memories come from the times I’ve either been on or near glaciers. Glaciers aren’t inherently dangerous…but they’re in a continuous state of flux as the ice that forms them moves across the land beneath. So…glacier travel can pose a number of different challenges from hiking in snow-covered terrain. 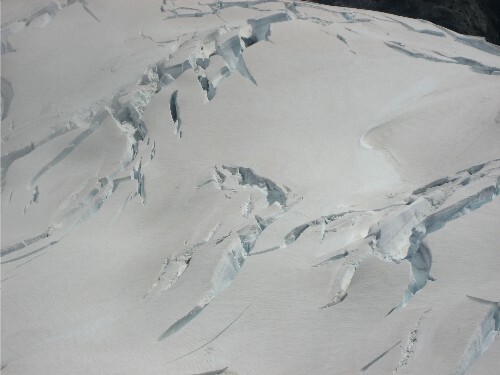 I just posted an article on the About.com Survival Skills site titled “Survive Glacier Hiking Hazards,” in which I discuss specific glacier terrain challenges including crevasses, seracs, and bergschrunds. I’ve encountered glaciated terrain in the Alps, in New Zealand, and in Antarctica. 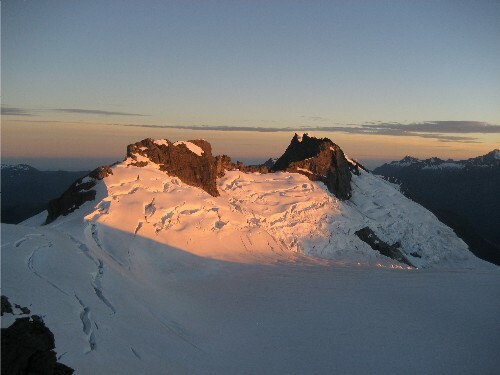 Here are a few photos that capture the terrain characteristics you’ll likely encounter if you’re hiking, skiing, or climbing in a glaciated area. 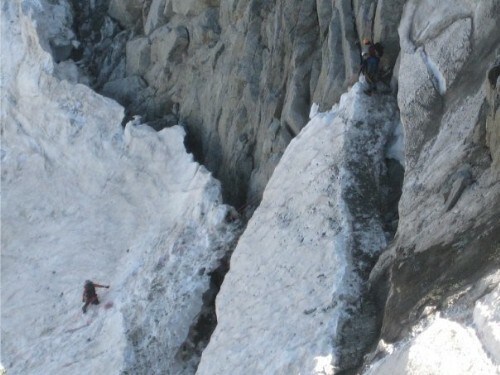 Seracs, or ice cliffs…these seracs are on the Glacier d’Argentiere near Chamonix, France. 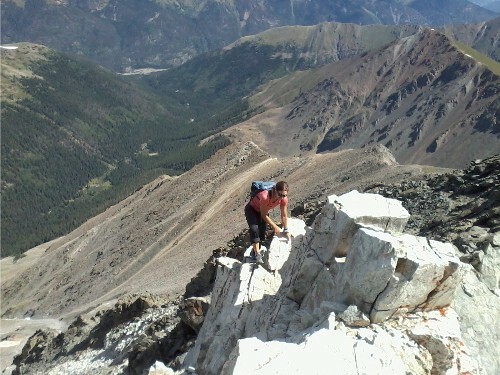 My friend Andy and I were climbing nearby when I took this photo. 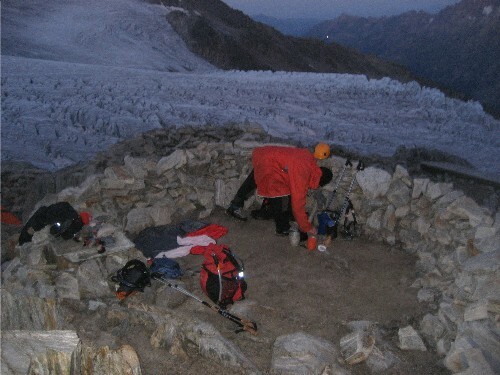 Below, Andy is organizing his gear in one of our bivouacs above the Glacier du Tour, also near Chamomix, France. I love the puzzle of seracs behind him in this photo…we were forced to bivouac that night because it took us too long on our supposed short cut through the seracs, and we missed the last lift down that eve. Want to know more about crevasses, seracs, and bergschrunds? 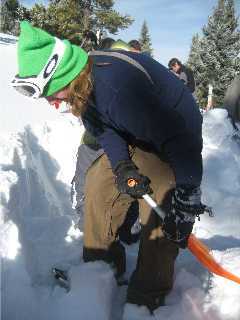 Several organizations here in the Vail Valley have partnered to offer a community avalanche awareness series. Each month, for four months, different members from the community are speaking on avalanche-related topics such as gear, terrain, weather, and rescue. 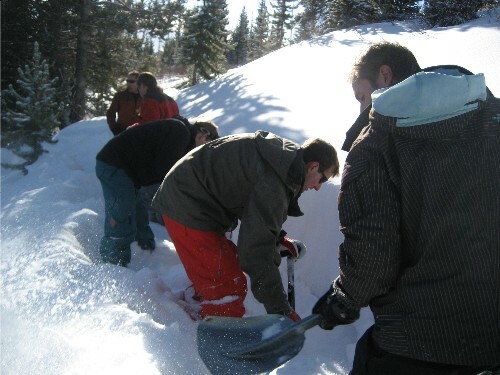 While these workshops are helpful and informative, taking an avalanche class, such as a Level I or Level II Avalanche course, can be incredibly informative and more in-depth than a workshop or lecture series. What to expect from a Level I Avalanche Course? 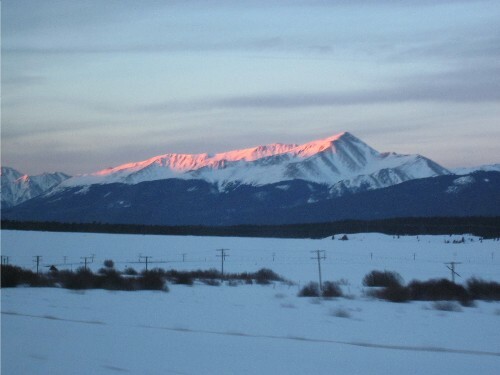 I took my course at the Colorado Mountain College campus in Edwards, Colorado. 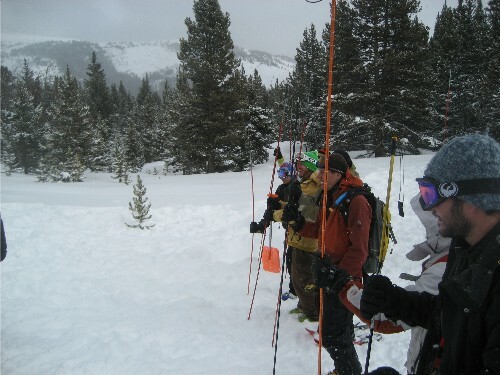 About 15 people were in the class, and it was taught by avalanche gurus including ski patrollers, avalanche forecasters, and local terrain experts. We read material, watch videos, listened to lectures, and discussed scenarios in several evening class. 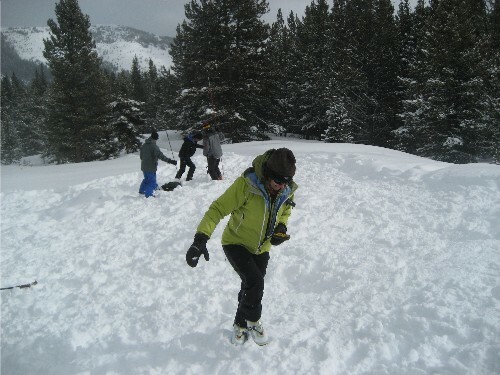 We also practiced using essential avalanche gear, including beacons, shovels, and probes. Our instructor buried beacons, and we searched in teams. 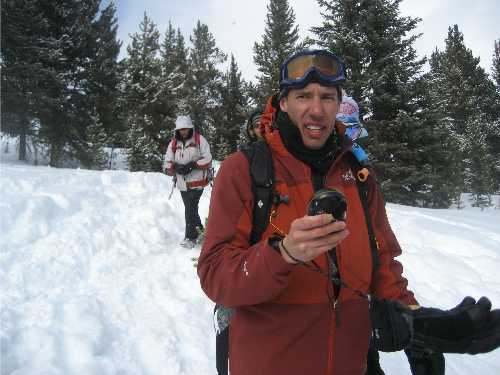 An avalanche beacon can help searchers locate a person who has been swept away or buried by an avalanche. 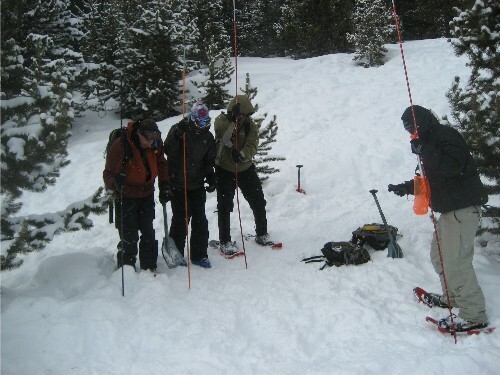 An avalanche probe can help fine-tune a buried victim’s location once a beacon has helped searchers narrow down the location. 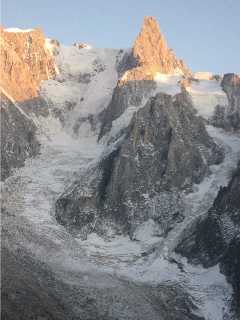 Finally rescuers need to carry a shovel in order to dig out a person who has been buried by an avalanche. 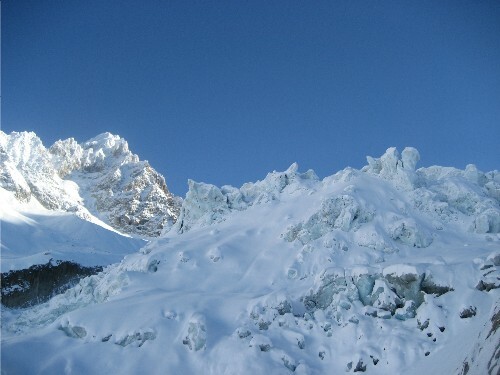 Want to know more about these three pieces of essential avalanche survival gear?